Chad and Megan’s proposal story is perfect down to the very last detail. Seriously, is there anything Chad didn’t think of? The location, the ring…Megan was thrilled with it all. But little did she know, he had even more surprises planned for the evening. “I work for my step-dad’s NHRA drag racing super team and we raced Valentine’s Day weekend in Pomona, California. We decided that since our Valentine’s Day was going to be spent cheering on Don Schumacher Racing’s three 10,000 horsepower Top Fuel dragsters and four nitro-burning Funny Cars, we would take an extra day and have a belated Valentine’s Day celebration in Laguna Beach, California. “We spent our day off at lunch at The Deck on Laguna Beach, catching up with friends before heading back to the Ritz-Carlton for a photo shoot we had planned with Katie from Flytographer. We had stayed at the Ritz-Carlton Laguna Niguel a few months prior and fell in love with the resort. I had thought it would be a fun idea to do a photo shoot there since it had become one of our favourite places. Little did I know, I had a small hand in planning my own engagement. 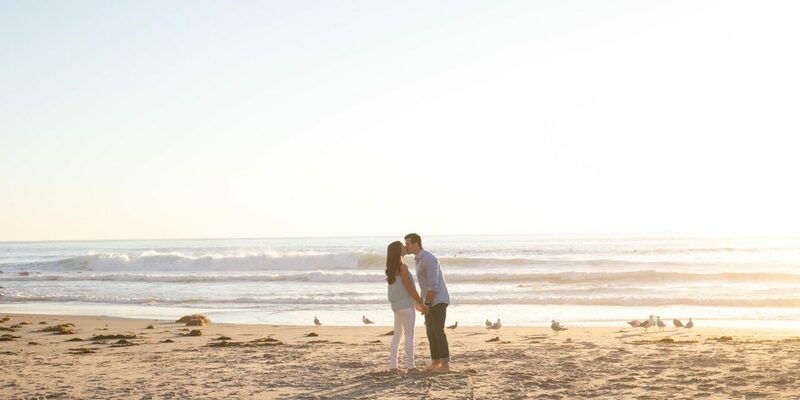 “We were down on the beach at sunset taking photos and all of a sudden Chad got down on one knee. I didn’t let him get a word out before I exclaimed, ‘What are you doing! ?’ I was so shocked. He then told me how much he loved me and asked me to marry him. I had to ask him later what he said to me because I’m pretty sure I was so shocked, I blacked out during the actual proposal. “I was so surprised – it was amazing to have Flytographer there to capture that moment. After the proposal, I found out just how long Chad had been planning this proposal – three months, to be exact. He had planned out every detail from the timing of the sunset to the design of the ring. “After our photo shoot, I figured we would have dinner and call our friends and family. Little did I know, there were more surprises ahead. “We walked up the hill from the beach and back to the resort. We approached a gazebo that was overlooking the ocean and saw a candlelit table for two – that was where our dinner would be. Chad planned every detail of the menu and each course included my favourite foods. The topper was the dessert, a Sprinkles sundae. Anyone that knows me knows how much I love the chain Sprinkles and their cupcakes and ice cream.